Once you start making homemade greek yogurt, it opens the doors to making Labneh cheese balls, which is a yogurt cheese with multiple uses. 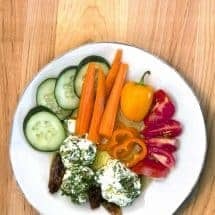 What are Labneh Cheese Balls? One way to think of it is as a substitute for cream cheese, except I’ve typically not seen it used as a sweet substitute, but rather more of a savory one. You can of course combine it with honey or pomegranate molasses for a sweet treat. Making Labneh it not complicated, but it does require patience. The way this is made is that you start with regular or greek yogurt–but then you have to strain it even further. In fact, I let my yogurt strain for at least 2-3 days before I even attempt to start making this. See what I mean about patience? 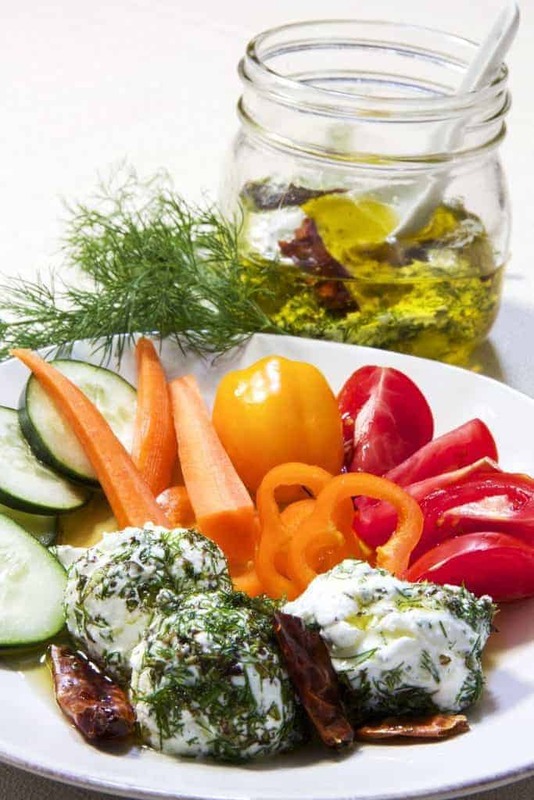 There are two popular strainers that I can recommend for making the Labneh Cheese Balls. If you have a small amount of yogurt to strain, say about 2 cups or so, the Donvier Cuispro works like a dream. It doesn’t take up half your fridge shelf space, the grid is tilted, so the bottom of the yogurt stays clean, and it also washes up no trouble. I use this to make Greek Yogurt as well. If you have a larger quantity to strain, then the Eurocuisine strainer works excellently. It’s sturdily built, holds a lot, washes clean and keeps the yogurt out of the whey entirely. But if you’re not sure about any of this, you can use a large coffee filter to strain the yogurt. The longer you let it sit, the firmer the yogurt balls. If you get impatient, remember you don’t have to be able to roll them into balls and preserve them. You can just spread the strained labneh onto a plate and garnish with some good olive oil. Decide whether you will be eating them fresh, or preserving them. I wanted to create Labneh Cheese balls that would be preserved for a bit, so I created cheese balls that I could put into a jar and cover with oil that I am infusing. This meant I had to drain them for longer. Realize you could use whatever herbs and spices you want. Just start with these and see what you’d like to change next time. 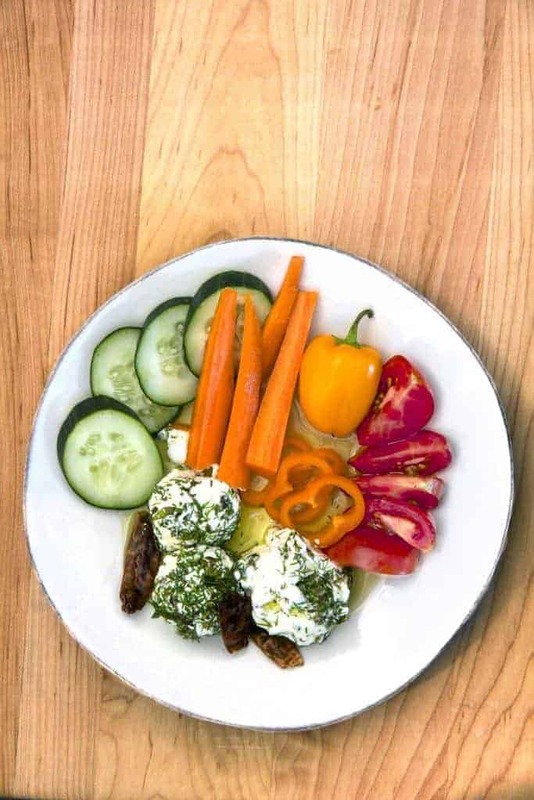 Homemade Labneh Cheese balls allow you to combine thickened greek yogurt with the spices of your choice to make either a sweet or savory side dish. In a clean, 1 pint mason jar, pour in the olive oil. Add garlic and chilis and set aside and let is sit for 2-3 days as the yogurt drains. Place Greek Yogurt in a strainer, and allow it to drain for 2-3 days in the refrigerator. 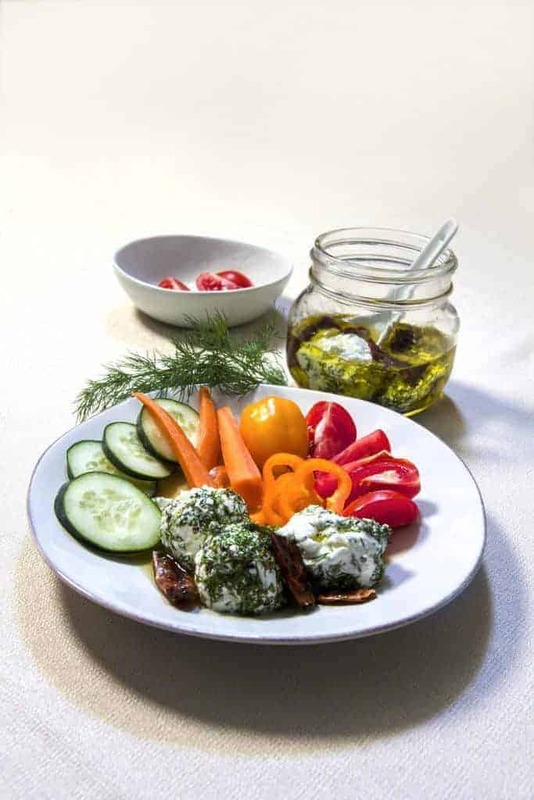 When ready, chop the mint and the dill finely, mix together, and spread across a plate. Remove the yogurt from the strainer and mix with 1 teaspoon salt. Shape the yogurt into small balls. Roll the balls into the minced dill and mint. Place each ball into the jar of flavored oil. Add additional oil if needed. You want the yogurt balls submerged into the oil so they stay preserved, and not exposed to air. When ready to serve, remove 1-2 balls carefully and place into a bowl or plate. Serve with raw vegetables, crackers, or pita bread triangles, or pita chips. Not sure what is in Greek Yogurt after the whey is drained. Depends on how much oil you use to spread across your cheese.